Why Shop Small and Buy Your Sewing or Quilting Machine at The Fabric Garden? We're an authorized Janome Dealer since 1984, and we've been in business since 1978. 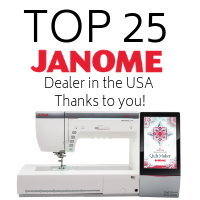 We are a Top 35 Janome Dealer from over 700 Janome dealers in the country, due in large part to our commitment to your satisfaction and knowledge of our products. We're not happy until you are happy. Questions about your Fabric Garden machine purchase? We're here 7 days a week by phone or in person to help, so you can create with confidence. Real, live people are here to help you, with over 300 combined years working with Janome products and years of Janome training. 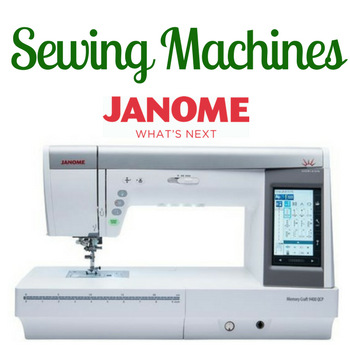 We attend Janome workshops in order to be well-versed in all aspects of their machines. 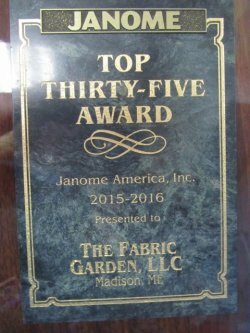 Award-Winning Customer Service: We are consistently recognized by Janome and awarded for Outstanding Customer Service. Come see our wall of awards! Free one-on-one machine lessons so you know the ins and outs of your machine. We have over 25 models of Janome in-stock to choose from, plus a variety of fine Necchi machines. Machines for Quilting, Embroidery, Sewing, Home Decor, Serging plus Longarm Quilting. We test-drive all machines to ensure they're running perfectly. Problem with your machine or just need it serviced? Just drop it off at our shop! We are an Authorized Janome Service Center. If you purchased your machine from The Fabric Garden, we offer free loaner machines so you can keep on sewing, plus a discount on annual service! FREE SHIPPING on all Sewing Machines!